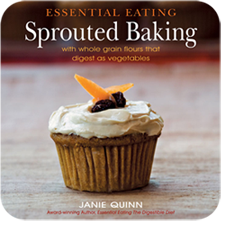 Sprouted flour is suitable for all your baking needs and can be substituted one for one for all-purpose or whole grain flour in most recipes or formulations. 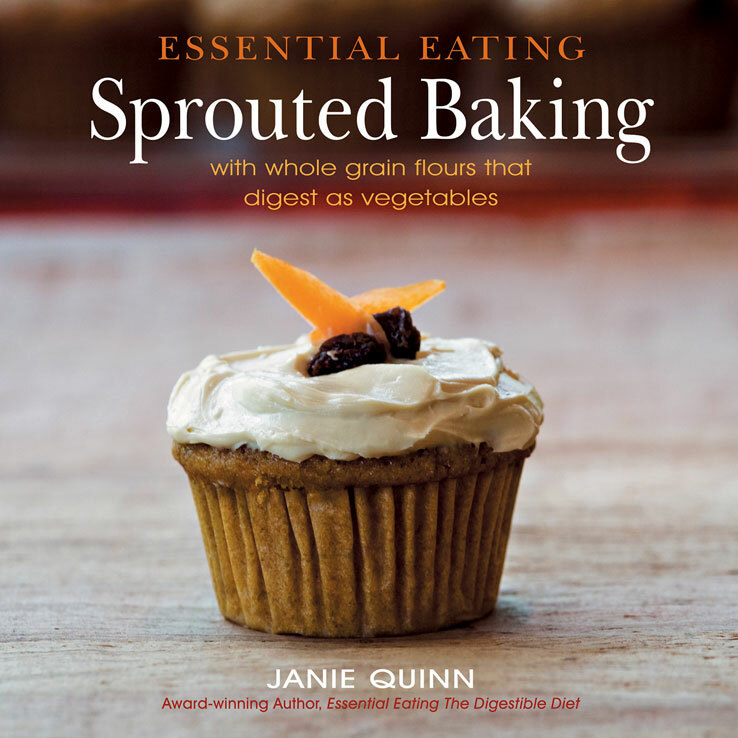 Featuring appetizing baked goods ranging from sunrise pancakes to maple banana muffins and cinnamon animal crackers to brownie pie, this cookbook is full of tasty treats made from sprouted flour. As an alternative to traditional flours, these easy-to-use recipes using sprouted flour open up an entirely new avenue of cuisine for both those suffering with wheat and other grain sensitivities and those who simply want to eat better. A preventative measure as well as a remedy for "dis-ease," this handbook outlines a nondeprivation eating plan for good health based on great-tasting, easy-to-digest foods. Beginning with an analysis of modern-day eating habits, the plan examines those food combinations, ingredients, and chemicals found in the standard American fare—white flour, sugar, and preservatives among them—which are typically at the root of indigestion and weight gain. Having exposed the culprits, the step-by-step guide identifies alternatives from each food category—including lots of fruits, veggies, and good fats—and offers time-saving recipes, streamlined preparation steps, and hints on what amount of food should be consumed and in what combinations in order to achieve and maintain good digestion. Sprouted Whole Wheat and Spelt Flours are available. Wheat is higher in gluten therefore preferred for bread or yeast baking over spelt. Spelt may be used in yeast baking, but will produce a lower rise. In general, Essential Eating Sprouted Flours take on slightly more water (higher hydration) and do not like to be over mixed. They perform well in both household and commercial food applications in a 1:1 ratio. Use them the same as you would other flours in your recipes. It's back-to-school time and we've had a lot of requests for an organic sprouted flour sandwich bread recipe. Remember sprouted flour is 100% whole grain, but without the bitter taste of traditional unsprouted whole grains. Here's my favorite recipe with play by play photos! It takes less than 5 minutes to put the 6 ingredients in the bread machine and press start. Go away and when you come back in just over 2 hours you have a delicious, organic sprouted flour and whole grain bread that slices beautifully for sandwiches. It's so easy. If you don't have a bread machine, ask your Aunt, stop by a yard sale or look in your friends garage. Adoptable bread machines abound. If you want to purchase a new one, I like the Breadman. It sells for $99 at cooking.com or department stores. I prefer a machine that makes a horizontal loaf of bread, versus ones that make a tall thin loaf. It is important that the ingredients are room temperature. 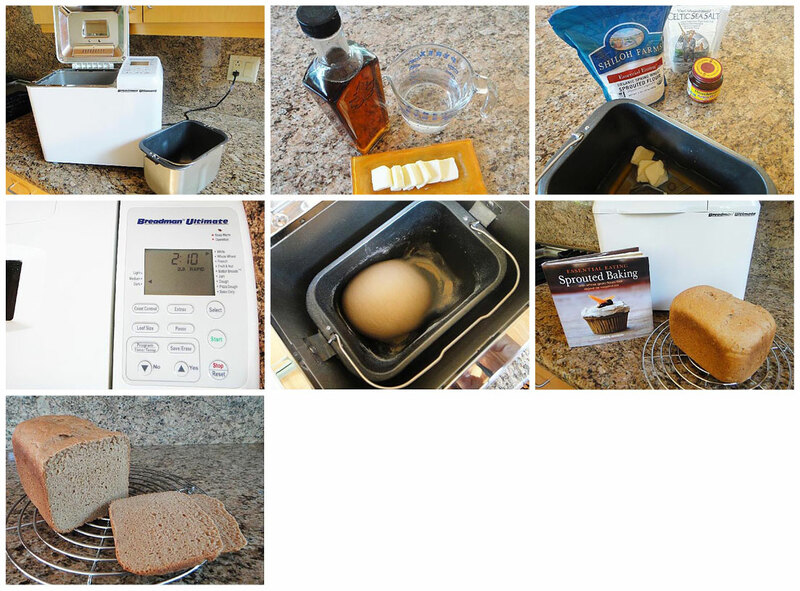 Place the wet ingredients (butter, syrup and water) in the pan of the bread machine. Add the dry ingredients ( flour, salt and yeast), ending with the yeast on top so it doesn't come in contact with the wet ingredients. Put the pan in to machine and MAKE SURE it clicks into place. Close the lid and program for basic rapid cycle, medium crust and 2 lb loaf; press start. Machines vary, but mine takes 2 hours and 10 minutes to complete the cycle. You don't have to be around when it finishes, it will cool in the machine. You can also program it to be ready when you awake!. Now here's a big TRICK. After you press the start button the dough will mix in the machine about 25 minutes. If you don't have to run out the door, after the dough has mixed about 10-15 minutes OPEN the lid and see if the dough is coming together and forming a ball. I know, the direction say never to open the lid, but this check is fine and it makes sure you didn't forget something. I have opened the lid upon occasion and was glad that I could adjust it before I ruined the entire cycle. The dough should form a ball and easily spin around in the pan at the end of the first mix cycle. When the baking cycle is completed, remove pan from machine with POT HOLDERS as it will be hot. Turn out bread onto wire rack to cool. No worries, there will be a small whole in the bottom from the blade. Wait at least 10 minutes before slicing. Then smother with organic grass-fed butter and enjoy your sprouted flour whole grain bread! 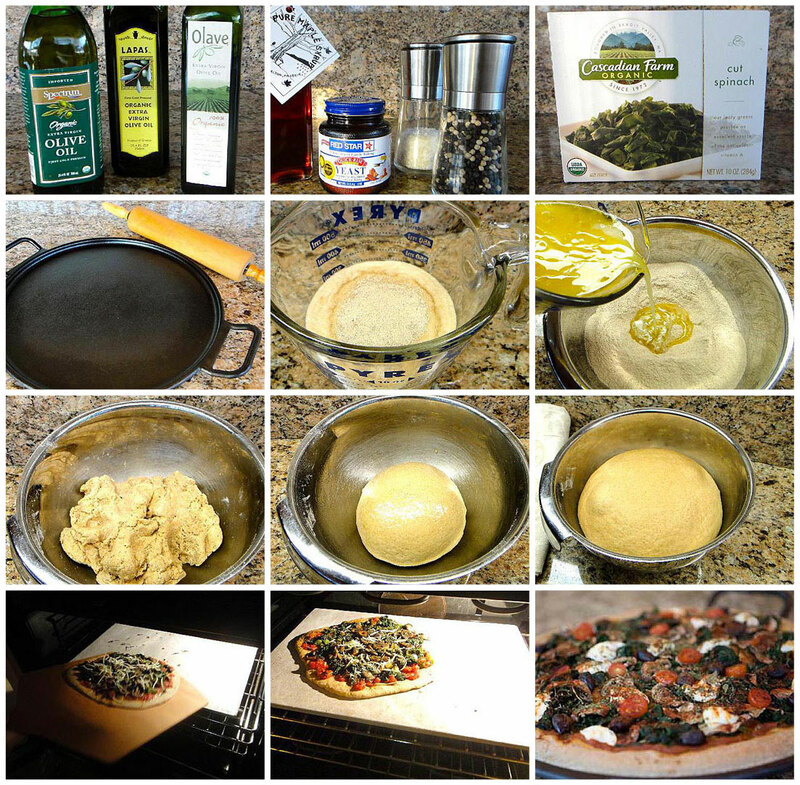 Hold onto your pot holders pizza fans because pizza crust made with sprouted flour tastes amazing and is easy to make. You get the benefits of 100% whole grain fiber without the bitter taste of unsprouted flour. Plus, the flour digests as a veggie! If you're already making homemade pizza dough, just switch your flour to sprouted flour and you're set. In case you need a recipe, I've included my favorite below. You can even us it in a bread machine. It takes less time if you make the crust by hand, but if you use the bread machine it does all the work. This recipe makes one 15-inch thick or two thin pizzas. I use either my cast iron round pan shown in the picture below or a baking stone. To make dough by hand: place ingredients in a large bowl and mix well. Remove dough from the bowl and knead into smooth dough for 5 – 8 minutes and then form into a ball. (Dough may also be mixed in food processor) Coat bowl with olive oil; place dough in bowl and turn once to coat with oil. Cover with a clean dish towel and let stand for 30-45 minutes or until doubled in size. Roll into desired size. Place on pre-heated greased baking pan; carefully press dough to edges of hot pan; add desired toppings. Bake 8 -12 minutes. Or a pizza stone may be used. Preheat stone, slide pizza onto stone with pizza wheel and bake as above. To make dough in a bread machine: Place room-temperature ingredients for the dough in the baking pan of a bread machine in the order listed. Program the machine for pizza dough and press start. Remove from machine; roll into desired size and bake as listed above. With just 5 pantry ingredients, you can have easy sprouted flaky biscuits in no time. Preheat your oven to 400 degrees. In a large bowl, whisk dry ingredients. Cut butter into dry ingredients with a knife or pastry blender. Put yogurt and water in a glass measuring cup. Using a fork, mix into dry ingredients making a sticky dough. Knead 6-8 times on lightly floured surface. Pat dough to 3/4-inch thickness. Cut out 12 biscuits with a round cookie cutter, glass or canning jar lid. Combine trimmings, knead and cut. Place on ungreased cookie sheet or use parchment paper. Bake at 400 degrees for 8-12 minutes or until slightly browned. Enjoy these biscuits made with organic sprouted flour that digests as a veggie! Now that the school season is back in session, it's time to whip up some quick, delicious and nutritious after-school snacks for your youngsters. This recipe for Essential Eating's Sprouted Pizza Cookie is the perfect solution. Why? Because, along with its scrumptious taste, the sprouted flour will digest with quick ease and still leave your kids with an appetite for dinner! Does it get any better than that? Try it for yourself! 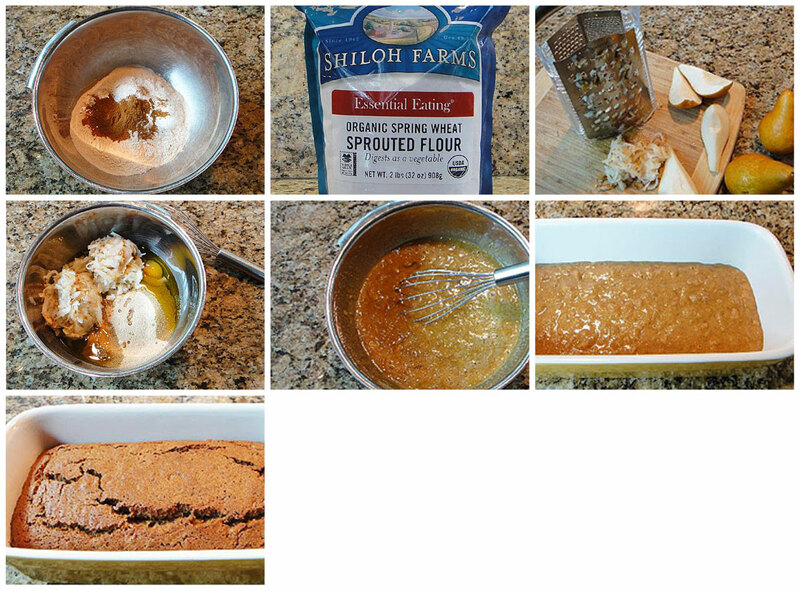 I just whipped up this sprouted flour dessert for my Valentine's tonight. This very easy cobbler was just the ticket for my busy schedule today. Preheat over to 350 degrees. In a small saucepan combine 1/2 cup sugar, arrowroot and berries. If you don't have arrowroot, a thickener found in the spice section, it will just make your cobbler liquid a little thiner. Bring to boil, reduce heat to simmer about 2 minutes until the sugar dissolves and the berries release their juices. Remove from heat. Pour melted butter into 2 quart baking dish. In a small bowl, combine remaining 1/2 cup sugar, flour and baking powder; add yogurt and water. Mix until just combined. Spoon batter over butter. Do not stir. Spoon berry mixture over batter. Bake for 30 minutes, until crust rises to the top and browns. Preheat oven to 350 degrees. Grease a 8x8-inch square pan. For the caramel: Place the syrup in a small skillet or saucepan. Over medium heat, stir frequently bringing syrup to a boil; stop stirring and turn the heat to high and cook until the liquid is deep amber in color and slightly thicker. Pour caramel into prepared pan and swirl to cover the bottom. Set aside to cool 5 minutes. Arrange apricot wedges over cooled caramel. 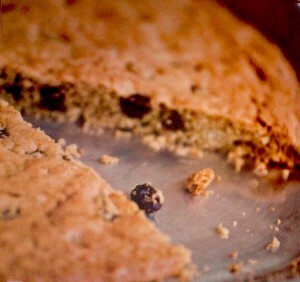 For the cake: In a medium bowl combine the flour, baking powder, cinnamon and salt; set aside. In the bowl of an electric mixer beat the butter, sugar and vanilla. Add eggs one at a time and beat until mixed. Using a spatula, alternatively fold the flour mixture and the yogurt into the egg mixture. Carefully spoon large dollops of batter evenly over the apricots. Tap the pan gently on the counter to release air bubbles. Bake 30-40 minutes until lightly browned and toothpick inserted in the center comes out clean. Remove pan from oven and run a knife around the edges. Put a plate or cutting board on top of the pan. Invert but do not remove the pan for 5 minutes. Remove pan and serve warm or at room temperature. Preheat oven to 325 degrees. In an electric mixer, cream butter, oil and sugar. Add eggs, yogurt and vanilla; blend well. In a separate bowl, whisk dry ingredients and add to butter mixture. Add grated zucchini, and mix well. Spread batter into a greased and floured 9×13 inch pan. Sprinkle chips on top and bake 35-40 minutes until center tests done with a toothpick and edges slightly pull away from sides. Cool and cut into squares. Enjoy an easy, moist and delicious cake made with a veggie and sprouted whole grain flour that digests as a veggie! The chill in the air and the abundance of organic pumpkins from our local farmer put me in the mood to do some baking using pumpkin and sprouted flour. One of my family's favorite recipes is my Pumpkin Spice Cake. The recipe uses 2 cups of pumpkin and it can be canned or fresh. 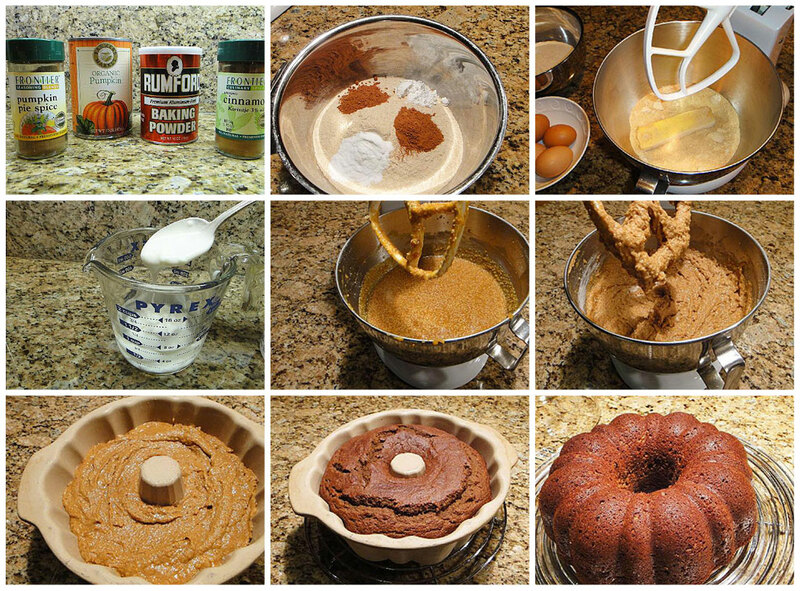 Sprouted Flour Pumpkin Spice Cake is an easy recipe and produces a delicious seasonal treat. Preheat oven to 350 degrees. 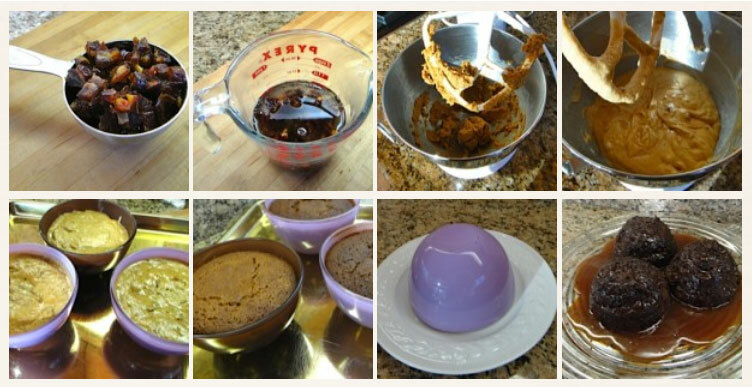 Grease 12 cup bundt pan. In a medium bowl combine the dry ingredients – the first six ingredients above. Using an electric mixer, cream butter and sugar in a large bowl. Add eggs one at a time, beating well after each addition. Add yogurt and water. An easy way to measure the yogurt and water is to place 1/2 cup water in a glass measuring cup and spoon in yogurt until the water level rises to the 1 cup line. Add pumpkin and vanilla, beat until combined. Stir in dry ingredients. Transfer to prepared pan. I use ghee or butter to grease all my baking pans. Baked until tester inserted comes out clean, about 45 minutes. Cool cake in pan on rack 20 minutes. Turn out cake onto rack and cool completely. Just in time for some holiday baking, this recipe can be made ahead and frozen. That is if you can get it in the freezer before it is eaten! This sweet bread recipe is a great way to use the abundance of seasonal pears available at farmer's markets this week. Preheat oven to 325 degrees. Grease 2 loaf pans or 2 8 x 8-inch pans. In a large bowl combine dry ingredients: flour, salt, cinnamon, powder and soda. Grate pears. Peeling the pears is optional. In a medium bowl combine the oil, eggs, sugar, pears and vanilla. Mix just until blended. In the large bowl of dry ingredients, make a well in the center and pour in liquid ingredients. Stir until just mixed. Do not over mix. Put batter in prepared pans. Bake loaf pans 50 minutes to 1 hour or bake square pans 35-40 minutes. It is done when toothpick inserted in the center comes out clean. Remove from oven and cool on wire racks before removing from pans. This recipe uses some of my favorite ingredients…pumpkin, cinnamon, quinoa flakes and sprouted flour. Oh, and don't let me forget to mention organic butter! Preheat oven to 350 degrees. For crust: In a medium bowl combine flour, quinoa flakes, 1/2 cup maple sugar and 1/2 cup butter. Mix with pastry knife or fork until crumbly. Press into ungreased 8 x 8-inch pan and bake for 15 minutes. Set aside while you prepare filling. For Filling: In a medium bowl combine pumpkin, yogurt, eggs, vanilla, sugar, salt, spices and baking powder. Beat well and pour over crust. Bake 20 minutes. 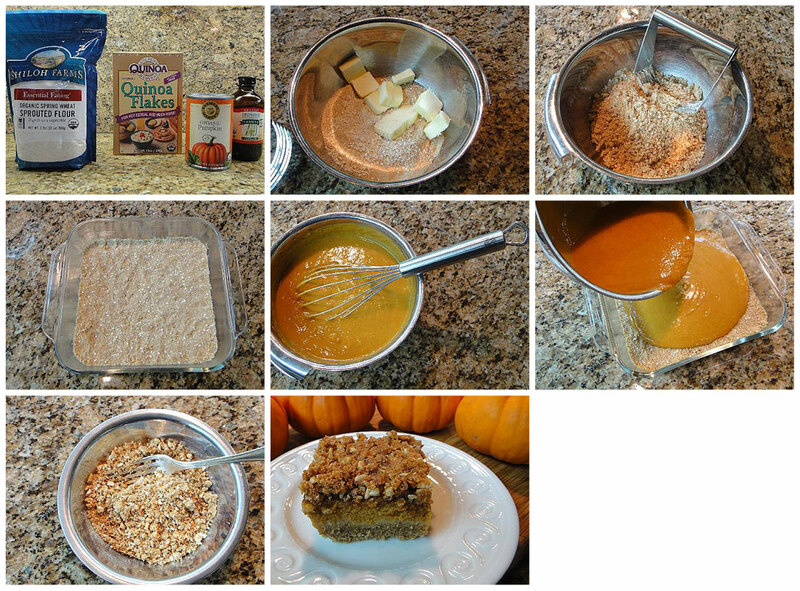 For Topping: In a small bowl combine nuts, 1/2 cup maple sugar and 2 tablespoons butter; sprinkle over pumpkin filling. 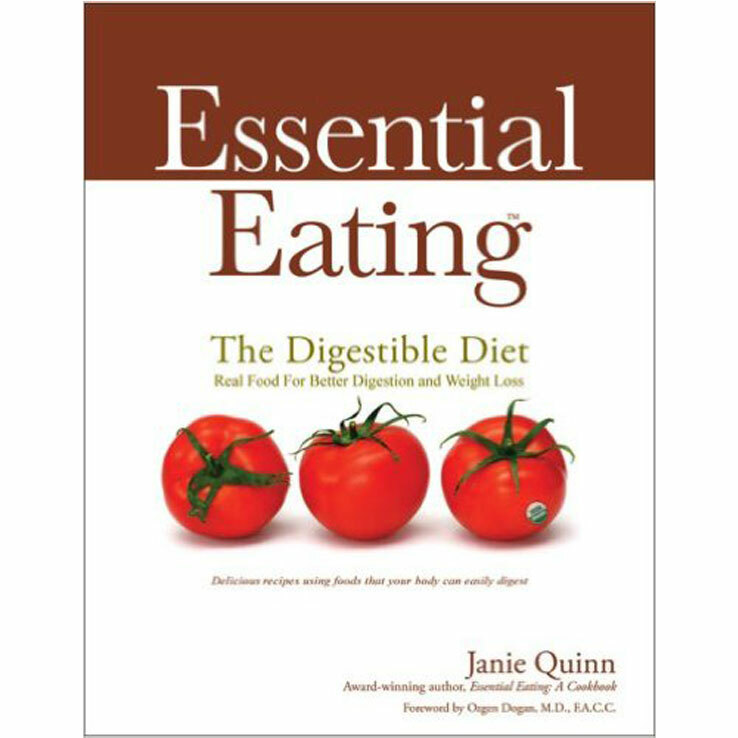 *For directions on how to prepare and sprout nuts for better digestion see page 156 in Essential Eating The Digestible Diet. Return to oven and bake for 15-20 minutes or until filling is set. 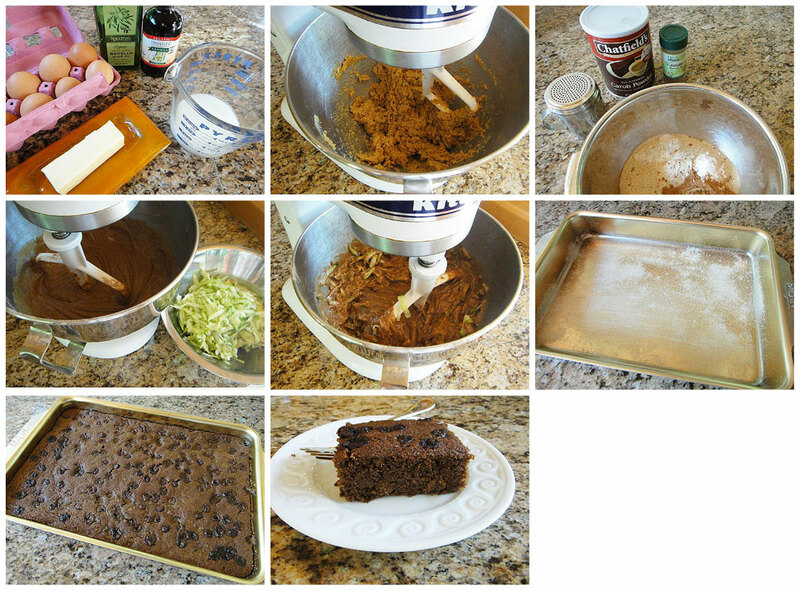 Cool in pan and cut into squares. Served warm, room temperature or chilled. 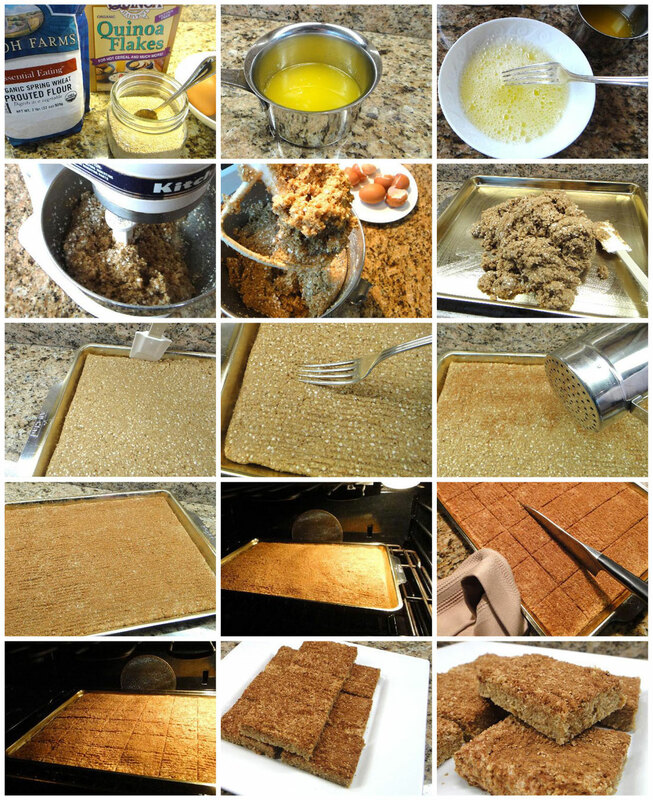 I created this recipe years ago out of necessity when I was on the road searching for a healthy snack bar. After reading many unpronounceable ingredients on about 25 different power bars in the grocery store, I set out to create a real food sprouted flour power bar that I felt good about eating and sharing…and that tasted great. This recipe uses a jelly roll pan and makes 36 good-sized bars that freeze beautifully. That is if you can get them into the freezer before everyone grabs a few! Preheat oven to 250 degrees. This recipe may be mixed by hand or by using a standing mixer. If you use a standing mixer, have all the ingredients ready so you can add them in a continuous order so as not to over mix. In a large bowl, mix together the ingredients, except the cinnamon, in the order listed. 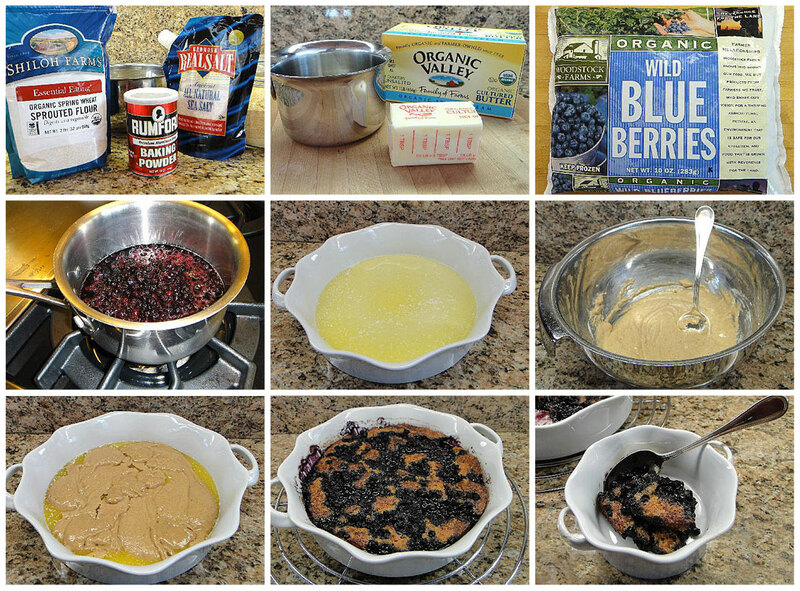 Place mixture on a greased jelly roll pan. With lightly moistened fingertips, press mixture evenly into a flat surface. Drag fork lightly over top to level. Use a rubber spatula to finish edges around pan. Sprinkle with cinnamon…and extra sugar if desired. Bake 45 minutes. Remove pan from oven and while warm, cut into bars. Return to oven for an additional 15 minutes or longer for desired crispness, remember bars will continue to firm up as they cool. Remove bars to wire rack to cool. About storing. I put a few in wax paper bags and put in a big ziplock bag in the freezer. Easy to grab and go. I put some in a glass container with wax paper between the layers and freeze. And then I leave some on the counter for the Cookie Monster. We are delighted to present to you a new recipe of Janie's that we think fits in perfectly for the holiday season. This time of year is jam packed with all kinds of goodies to enjoy. On top of that, everyone is cooking up a storm and giving the gift of yummy food that aims to comfort and please the palette. With that being said, why not try a wonderfully delectable (and healthy!) 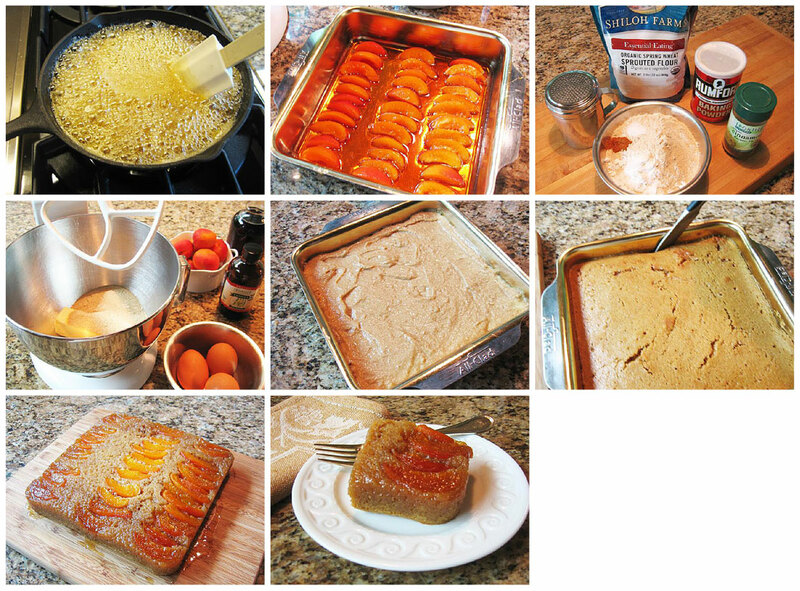 dessert pudding that is surely a healthy alternative without compromising taste or flavor? Place the dates in a bowl and add the boiling water. Add the vanilla, baking soda and coffee. In a bowl, cream the butter and sugar together until fluffy. Gradually add the eggs a small amount at a time, beating well. Alternate between folding in flour and date mixture and pour into a 2 cup pudding bowl. Place on a baking sheet and cook for 55 minutes to 1 hour. Pudding should be moist, not dry. When done baking, let pudding cool in pan for 10 minutes before inverting. Place a plate on top of the bowl and invert. Shake the bowl until the pudding turns out on to the plate. Take a "full fat" can of organic coconut milk and place it in the fridge for some time or best overnight. Make sure that you scoop out all of the thickened coconut cream and the coconut water is left in the can. (Save the coconut water to drink or to use in a shake). After scooping out the cream, add a little connamon and vanilla and whip it in a mixing bowl until it begins to thicken. Add a dollop with your toffee pudding. What do you get when you combine the idea of carrot cake and banana bread? 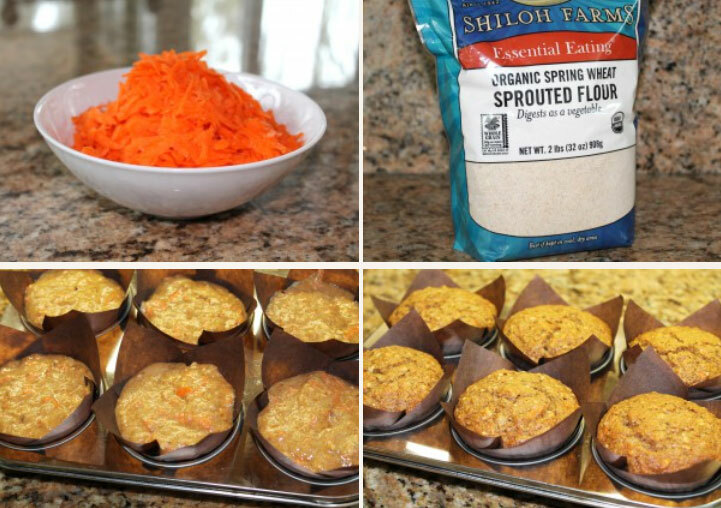 Essential Eating Sprouted Carrot Banana Muffins! This delicious and nutritious recipe is a perfect addition to your breakfast, lunch, afternoon snack, or dinner. And did we mention that they're super easy to make? Try them for yourself! We're confident you'll love them. In a small bowl, whisk the eggs, bananas and oil. Stir into dry ingredients just until moistened. Bake at 350F for 15-18 minutes or until a toothpick inserted near the center comes out clean. Cool for 10 minutes on a wire rack to cool completely. Place the nuts and sea salt in a bowl and cover with room temperature water. Preheat the over to 150F. Drain the almonds and spread them in a single layer on a stainless steel baking pan. Dry the nuts in the warm oven for 12 to 24 hours, stirring occasionally, until they are very dry and crisp. A dehydrator may be used instead of an oven. "Nest eggs" are a good thing, but Sprouted Nest Eggs are devine. Yesterday I picked up some organic sprouted bread by Mockingbird Bakery and organic eggs from Back Achers Farm at the Essential Eating Farmer's Market in Clarks Summit, PA and shazam…dinner! Nothing new about these ingredients, but they make for a fun presentation and everyone loved it. I'm sure it would be equally as popular on a Sunday morning. Slice bread if in loaf form. Place a biscuit or cookie cutter or juice jar over the center of the slice of bread and cut out the center. Reserve the center for toast or cute round sandwiches! Melt ghee or butter in skillet over medium heat. Place bread in skillet and crack egg in the hole in the center. Cook until the eggs starts to set. Flip and continue cooking until the egg is done to your liking. Season with salt and pepper. Serve with salsa and a green salad is optional. Labor Day is just around the corner and of course that includes enjoying good food with friends and family. The transition between summer and fall will be taking place and what better time to enjoy a cherry tart than on Labor Day? Everyone will love this delicious and nutritious guilt-free dessert. And their tummies will thank them too! For the crust: In the bowl of a food processor, pulse the flour, sugar and salt until combined, about 4 times. Add the butter and process until the mixture resembles coarse meal, about 10 seconds. With the processor running, add the egg yolks. Gradually pour in the water; process until the dough begins to come together, no more than 30 seconds. Pat the dough into a disk shape. The dough may be wrapped in waxed paper and refrigerated for later use. Please piece of parchment paper the size of a large baking sheet on the counter. Dust with flour and roll out an oval crust approximately 1/8 inch thick or less. To create the edges, fold over the dough to make a 1/2-to-1-inch border. Place the parchment paper with the crust on a baking sheet in preparation for baking. For the filling: Preheat the oven to 350F. In a medium bowl, combine all the filling ingredients. Let the mixture sit for 15 minutes, stirring occasionally. Pour the cherry mixture into a small strainer over a medium saucepan, allowing the juice to flow into the saucepan. 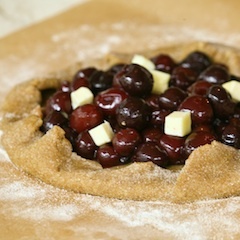 Place the strained cherries onto the prepared crust and dot with approximately 2 tablespoons cubed butter. Bake for about 25 minutes. Meanwhile, heat the remaining cherry juice in a saucepan over medium hear, stirring occasionally, until it thickens into a light syrup. Remove from the heat and set aside. When the tart has finished baking, remove it from the oven and place the sheet on a wire rack to cool. Before serving, pour the cherry glaze over the tart. Note: Recipe makes 1 large or 3 small tarts. Makes 12 servings.